One of the fractional-sized 2015 American Eagle gold bullion coins sold out, the United States Mint announced Friday, Nov. 13. No more will be struck. 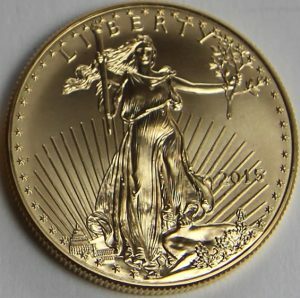 American Gold Eagles are produced in sizes of 1 ounce, 1/2 ounce, 1/4 ounce and 1/10 ounce and these correspond to denominations of $50, $25, $10 and $5. The one-quarter ounce or $10 gold coin is no longer available. "This is to inform you that the United States Mint has sold out of its remaining inventory of 2015 American Eagle One-Quarter Ounce Gold Bullion Coins," the bureau told its authorized distributers Friday. "No additional 2015-dated American Eagle Quarter-Ounce Gold Bullion Coins will be produced." The U.S. Mint said it will continue to sell its other 2015 bullion Gold Eagles until their inventories are depleted, and that "no additional 2015-dated production will follow after that." Sales of the $10 Gold Eagle reached 3,000 ounces this month after climbing 1,000 ounces last month. For the year, buyers scooped up 39,500 ounces for 158,000 coins. The figures mark a 33.9% increase over the 29,500 ounces, or 118,000 coins, sold in 2014. The coin is in the middle of the popularity pack with sales higher for the one-tenth ounce and one-ounce coins. Year-to-date Gold Eagle sales at 737,500 ounces are already 40.6% higher than the 524,500 ounces sold through all last year. The United States Mint also offers collector editions of American Gold Eagles. They are available in finishes of proof and uncirculated and each bears a ‘W’ mint mark to denote their production in the U.S. Mint at West Point. The bullion editions are also struck at West Point but they lack mint marks.